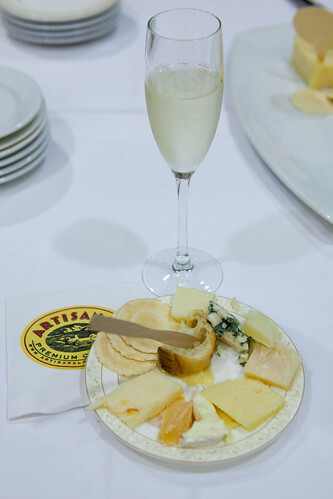 A few weeks ago I’ve attended to Artisanal Cheese‘s hands-on mozzarella class ($110). Of all the classes Artisanal has, this is the only class where attendees can make, taste, and take home containers full of freshly made mozzarella. It’s educational, fun and you’re certainly bound to have a stomach full of cheese, wine and a smidgen of bread by the end of the night. 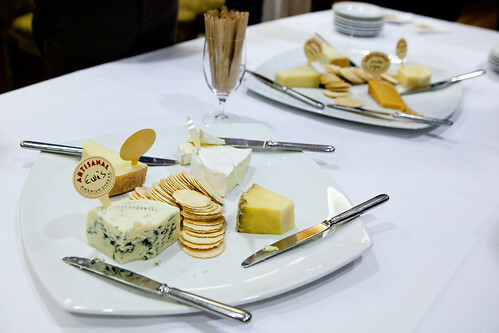 The class includes a reception where we can eat to our hearts content of gloriously delicious cheeses. Some of the most memorable of the eight set out were the complex, almost meaty flavored aged gouda, the creamy cheddar-like Cantalet, and the crumbly and subtly pungent Ewe’s Blue. 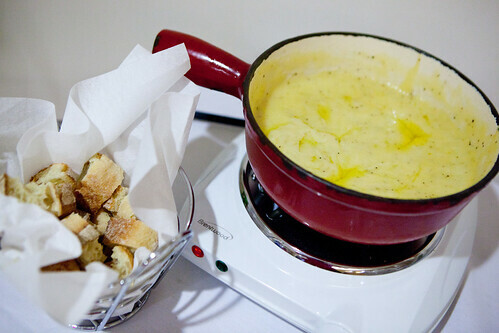 There were a warm pot of fondue to dip with baguette and glasses of crisp Prosecco to pair with the creamy cheeses. 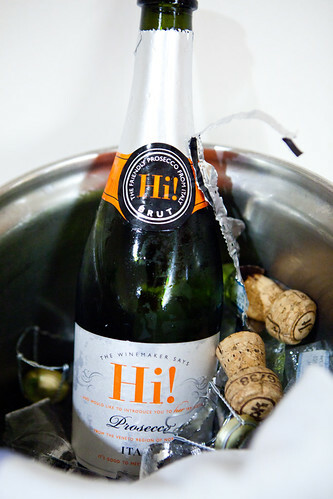 Once reception was over, we headed over to the classroom with our instructors waiting for us to settle in. 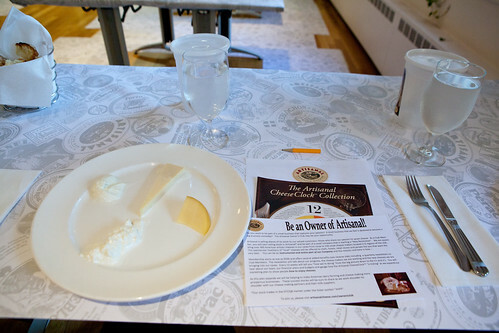 Each seat was arranged with plates filled of cheeses made of stretched curds set in a clock orientation. The four that were introduced and eaten were the creamy burrata, mind blowing delicious buffalo mozzarella, provolone, and smoked scarmoza cheeses. 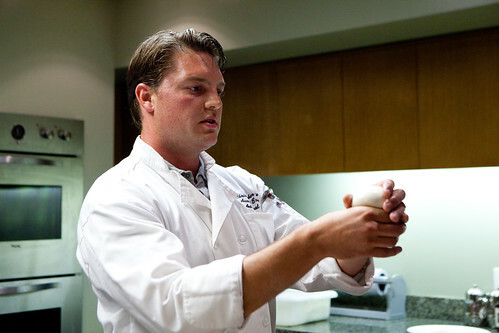 The difference between the burrata and a fresh mozzarella is mainly the addition of cream for the former cheese. 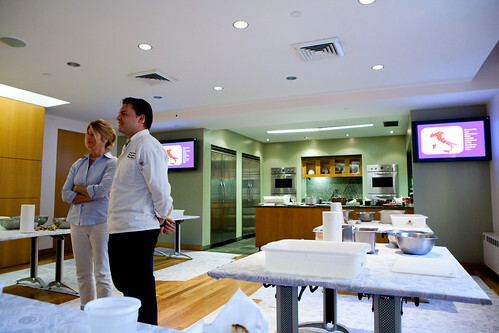 There was a short Powerpoint lesson as to how to make the curds and coagulating them (by use of rennet). Our instructors told us to wash our hands, as we’ll be stretching the curds shortly and divided the class into groups of 2-4 people per workstation. 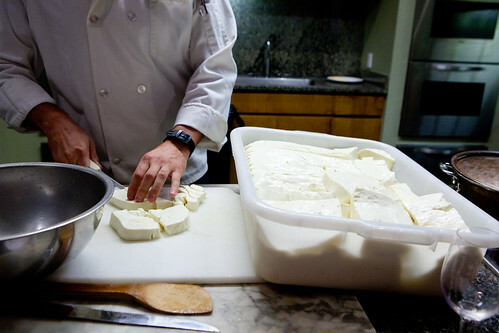 Take the prepared mozzarella curds, cut them into about the size of your finger (that’s how they put it). Salt the curds pretty generously as the curds are bland. Add hot water (about 190°F) that it’s about an inch above your curds and leave it alone for 30 seconds to a minute so it would slowly meld into one mass. 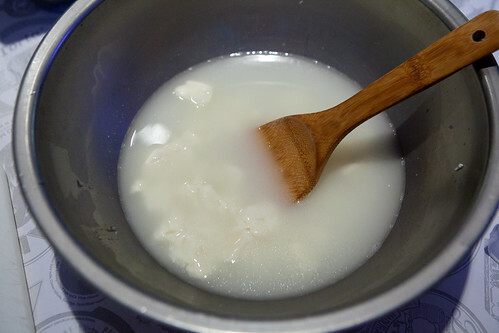 Take your wooden spoon to gently push the pieces of curd so it will adhere to each other. 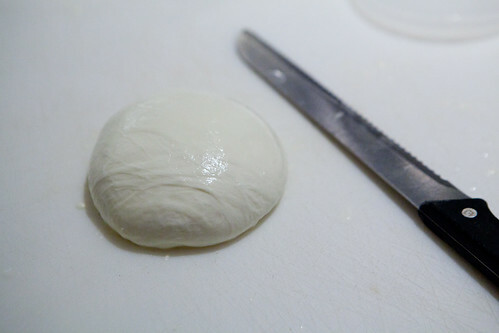 Once the water temperature isn’t too hot, reach in and start stretching the melted curds and eventually form it into a large supple ball of creamy mozzarella, like the one you see above. 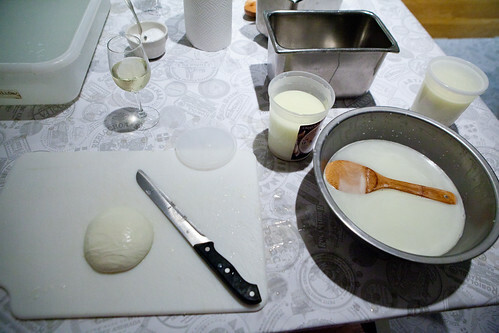 By the end of the evening (about 1.5 hours later), I was left with about 2 quart containers full of fresh mozzarella and its whey. 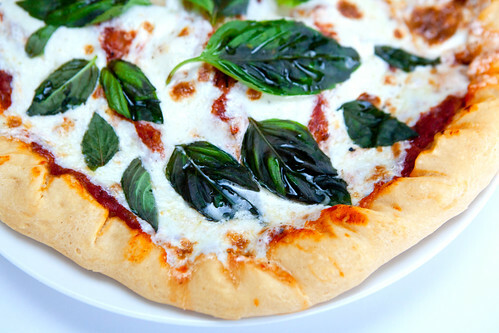 Since I can’t eat all of that cheese by myself, I invited some friends and family and thrown a pizza party at home and created those two types of pizzas: the classic margherita pizza and the seafood and chicken pizza. Everything is homemade/home grown in the former pizza except for the tomato sauce. 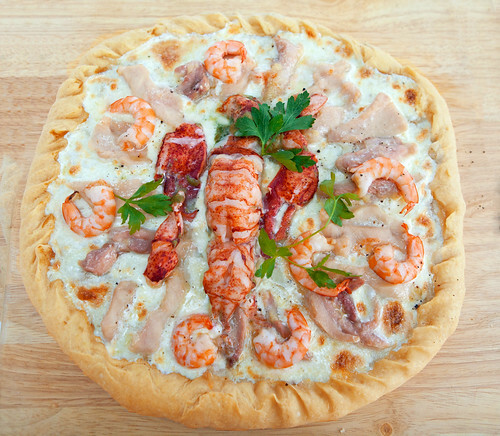 The seafood pizza is a crazy idea since my local ethnic market sold lobsters and shrimp inexpensively. I ended up leaving out the tomato sauce, smeared the crust with a concentrated black truffle sauce, layered it with the fresh mozzarella with the chicken. The lobster was partially steamed and shelled earlier and left to bake with the pizza toward the last 10 minutes. My guests enjoyed the pizzas (even though there’s a few raised brows about the seafood pizza but they enjoyed it nevertheless) and really loved the fresh mozzarella part of the pizza the most. 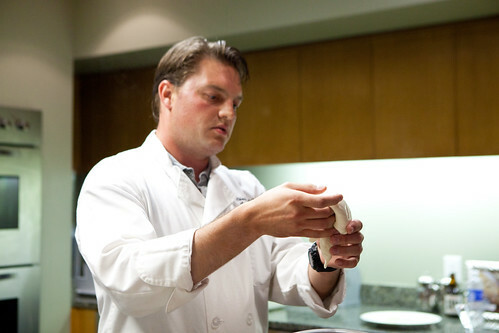 I would recommend Artisanal’s hands-on mozzarella making class, sure it’s a bit more expensive than their other classes but you’ll end up learning how to stretch your mozzarella, eat a lot of cheese (during and after the class) and make some new friends.